Now available from HARDI , NAVIGATOR 3000 and 4000 class leading sprayers with EAGLE boom have superior boom ride and performance over the ground, and now with SmoothRide trailer suspension the boom ride is even better. SmoothRide trailer suspension removes paddock condition shock transfer to the boom and provides a smoother ride for the nozzles to deliver precision spray application. The window of opportunity to spray on time is often small and being able to spray at a reasonable speed is important. Improving the boom performance of the sprayer delivers a better biological effect on the crop. The EAGLE boom on the NAVIGATOR sprayer has a unique coil spring centre suspension and inertia trapeze damping system which delivers industry best performance for booms between 18m and 30m. The shock and vibration created from driving over the paddock is typically transferred to the boom, however with SmoothRide the boom suspension does not have to work as hard. The NAVIGATOR SmoothRide suspension consists of a trailing arm axle system with two damper elements fixed between suspension cups. The damper elements are made of closed cell polypropylene, are very durable and are virtually maintenance free. SmoothRide suspension also increases sprayer performance, boom ride, spraying efficiency and capacity to spray more hectares. In addition to the ride, the HARDI NAVIGATOR tank and chassis design is unique and class leading. The front platform provides for easy access to the main tank and a 450L rinse tank is positioned over the axle for extra stability. 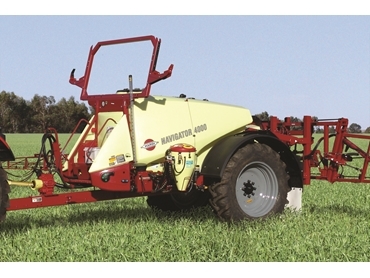 This sprayer has an outstanding 70cm to 80cm crop clearance with a low centre of gravity. The drawbar is fixed directly to the axle and absorbs vertical forces at high speeds. The NAVIGATOR sprayer has three axle options which provide adjustability from 1.5m to 2.25m and there is a 3m fixed option. A wide, stable paralift gives effortless boom height control to 2.2m, while two SmartValves provide control of all the primary operating functions, and a robust, grease-lubricated cast iron diaphragm pump runs the fluid system. A high capacity EasyClean suction filter is monitored by an external gauge. Chemical transfer with the Granni Pot uses a vortex inside the hopper for rapid mixing. Chemical transfer with the optional TurboFiller uses a TurboDeflector inside the hopper for rapid mixing. Further enhance the chemical transfer experience with the optional Granni Pot. To keep customers spraying easier, faster and more efficiently, HARDI guarantees that its products are built to the highest standard for long life and hassle-free service. Their operator training, warranty and service support ensures the most is acheived from an investment.